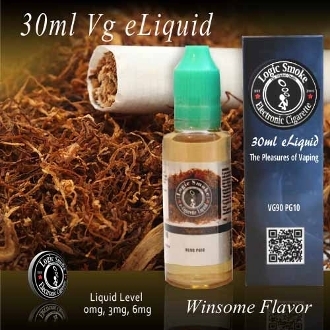 Similar to a popular red box brand of tobacco cigarettes, our Logic Smoke Winsome, tobacco flavored e liquid vaporizer, is a popular blend for former tobacco smokers. Its a stronger blend, not too harsh, but bold. Many a former tobacco smoker has turned to our Winsome flavored e-liquid. It provides the satisfying full bodied flavor of tobacco that they crave. You'll love it too. Try it today and check out our other tobacco flavored e-liquids as well. Start a new collection of Logic Smoke flavors for your vaping satisfaction!